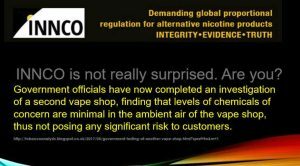 Government Testing of Another Vape Shop Reveals No Cause for Concern about Secondhand Vaping – Electronic Vaping Coalition of America – Vape Shops Want to Do Good, but Fear F.D.A. Won’t Let Them Do Well – Nanny State Index 2017 – Use of moist oral snuff (snus) and pancreatic cancer: Pooled analysis of nine prospective observational studies. – Fierce debates dominate D.C.’s first E-Cigarette Summit – Smokers’ days enjoying a fag and a pint outside may be numbered amid calls to extend ban – Snap Election – Who gets the Vaper’s Vote? Linda Hansen interviews the EVCA’s lead “Coordination” counsel on the next legal steps towards erasing FDA deeming rules. Like so many entrepreneurs who have opened vaping shops lately, Stephen D’Angelo was a heavy smoker who finally kicked nicotine after switching to electronic cigarettes, which he viewed as a healthier — and less smelly — alternative. Today sees the publication of the 2017 edition of the Nanny State Index, a league table of the best and worst places in the European Union to eat, drink, smoke and vape. Each country is given a score according to the scale of its paternalistic regulation of alcohol, e-cigarettes, food and tobacco. Use of moist oral snuff (snus) and pancreatic cancer: Pooled analysis of nine prospective observational studies. While smoking is a well-established risk factor for pancreatic cancer, the effect of smokeless tobacco is less well understood. We used pooled individual data from the Swedish Collaboration on Health Effects of Snus Use to assess the association between Swedish snus use and the risk of pancreatic cancer. Snap Election – Who gets the Vaper’s Vote? While the UK embraces electronic cigarettes for the rapid drop in smoking they have experienced, the U.S. Food and Drug Administration announced new regulations that will albeit ban them. A week after the UK Royal College of Physicians’ report Nicotine without smoke: tobacco harm reduction which supports smokers to switch to vaping, the FDA ruled that electronic cigarettes would be treated the same as harmful tobacco products.